Simple and easy to follow step-by-step instructions that show how to create a sitting and a laid down Easter Bunny using sugarpaste or marzipan. Simple and easy to follow step-by-step instructions that show how to create a hatching chick and a duck using sugarpaste or marzipan. Naturally dyed eggs are so elegant they can grace the table at an adult dinner party, but it's the kids who most enjoy a project like this. Read more about dyeing eggs naturally! For kids of all ages! Print the bunny and than color it or use it to decorate your cake. Get the color me Bunny! 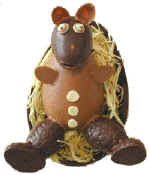 Advanced step-by-step instructions that show you how to create a Chocolate Egg Bunny. 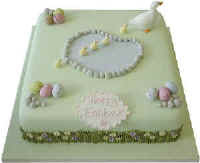 A cake decorating example that briefly explains how to decorate a cake with a chocolate bunny. A piped chicken decoration made with french meringue that can be used to decorate cakes, pastries and even as a table decoration. Pipe a chicken! A simply but tasty truffle cream (canache) that can be used to fill chocolate Easter eggs or anything else your chocoholic mind desires. Get the recipe! Easter rice tarts! Don't spend Easter without them Get the recipe! And finally, read about the history of Easter & its custom!